Hahaha. Great job, Julie! The caption fits. I can see FRESH in her eyes. The way she folds her arms too. Thanks. This made me smile today. (((hugs))) pal! Oh! So glad! She’s been warming my heart these last few days of doodling! Great eyebrows!! And love the graph paper. Thanks, Cathy. Paper comes with the app., but I like it too! That is awesome! I can see so much growth in your work. Thanks, Catherine. I love what the doodling is doing for me! Recovering engineer! I thought your background must be science – maybe both? You seem like quite the Renaissance woman to me! So cute. My caption — Don’t even think about it! Such a cutie! I wouldn’t want to tangle with her though. Great subject for the word! Oh this is too cute! I love the graph paper too, I used it a lot in my senior year in school. Anyway I love this expression, Julie! The paper is part of the app on my tablet, Diane – it is so costly these days I may have to rummage through my kids’ math sheets to use the other sides! this is awesome! great expression! Thank you. I am enjoying doodling around with this little character! Thanks for stopping by, Lolo. 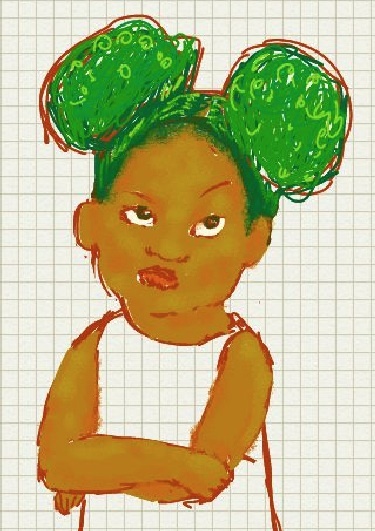 Good – I hadn’t actually thought about the hair as I had been drawing her broccoli locks for a couple days. Hey, did I just invent a PB-title for her? Yes, I do believe I did! Thanks, E – now all I need is a story! Done! It’s rough, but I LIKE it! This is my first visit here. Nice to meet you, Julie. I just popped over from Susanna Leonard Hill’s blog. Love, love, love this! Her expression is priceless. Thanks, Ruth. I appreciate your stopping by and the sweet comment!